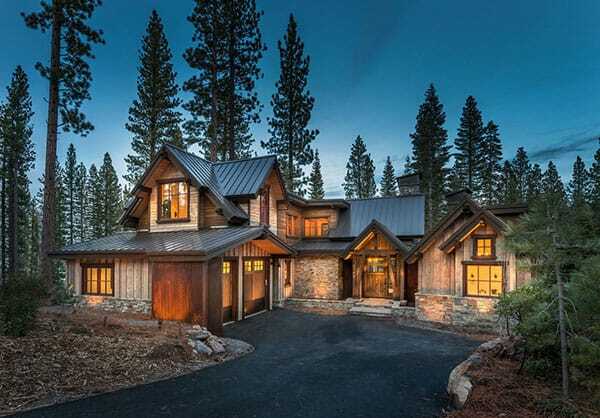 A modern rustic ski lodge infused with classic cabin decor was designed by , in collaboration with , located in Martis Camp, a gated community in Truckee, California. 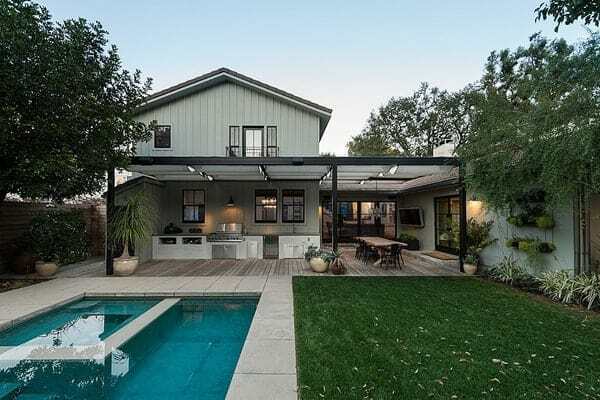 Comprised of 3,250 square feet of living space, this elegant home features rustic elements mixed with clean lines that are bright and modern. 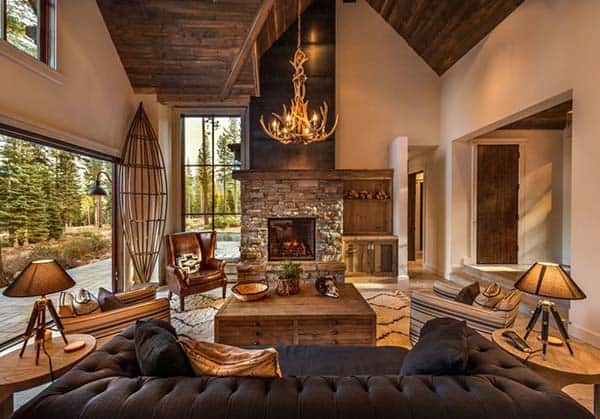 The living room features a warm stone clad gas fireplace and an antler chandelier from Restoration Hardware comprised of old barnwood suspended from a vaulted ceiling. 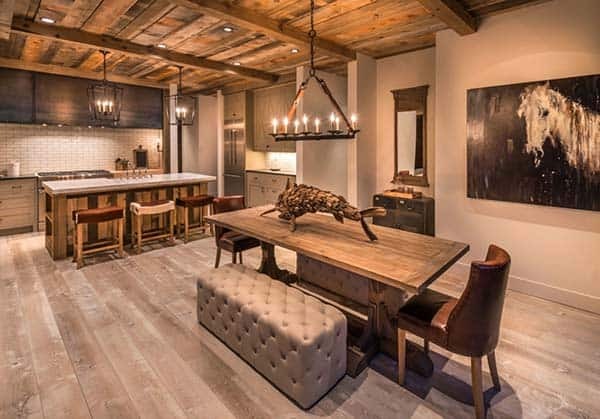 The main living spaces showcases wide plank engineered reclaimed white oak flooring, adding warmth and harmony. In the living room, a beautiful Moroccan rug grounds the space, adding texture and warmth. Cozy seating areas invites comfort, while built-in cabinetry keeps everything clean and timeless. 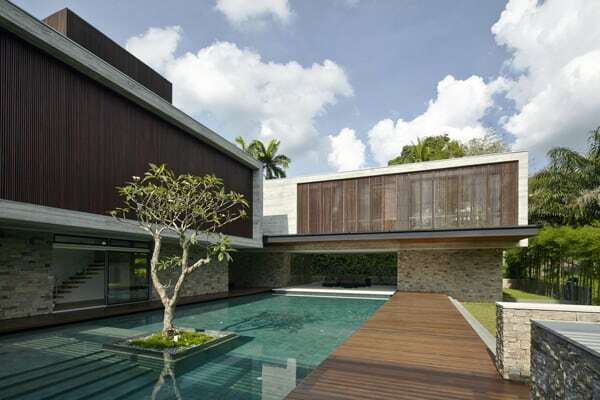 An expansive panel of sliding glass disappears into the wall and opens the interior up to the exterior living environment. 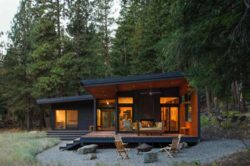 Although this home is a ski cabin perfect for retreating to during the snowy winter months, it was designed to use year round. An outdoor fireplace and barbecue allows the homeowner’s to enjoy the warm summer weather and all the activities this region has to offer. 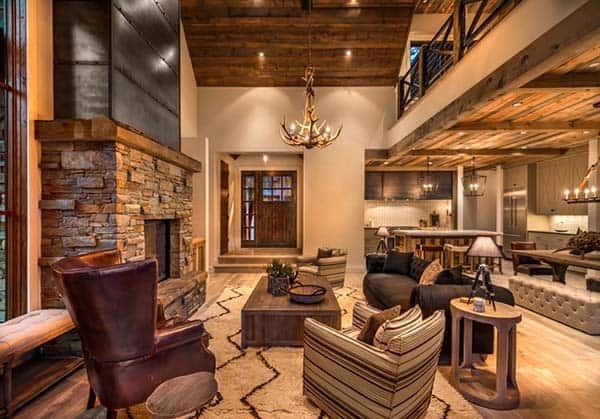 What We Love: What is there not to love about a mountain retreat with modern rustic design? 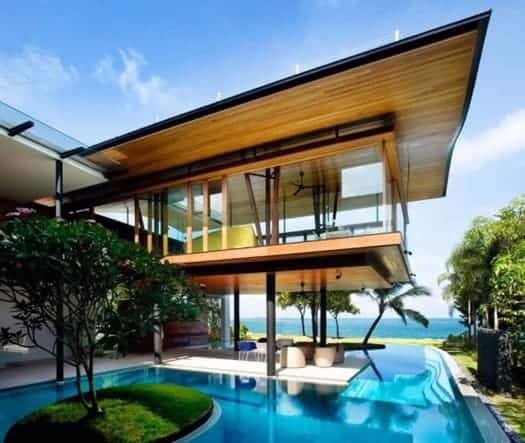 This home has a lot of charm, its cozy and warm with a very homey feeling; this would be an amazing retreat to visit during the holiday season. What do you think? 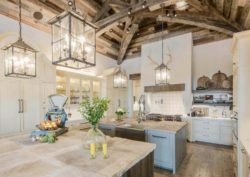 Creating a very beautiful aesthetic in the kitchen, the hood was extended across the range area. 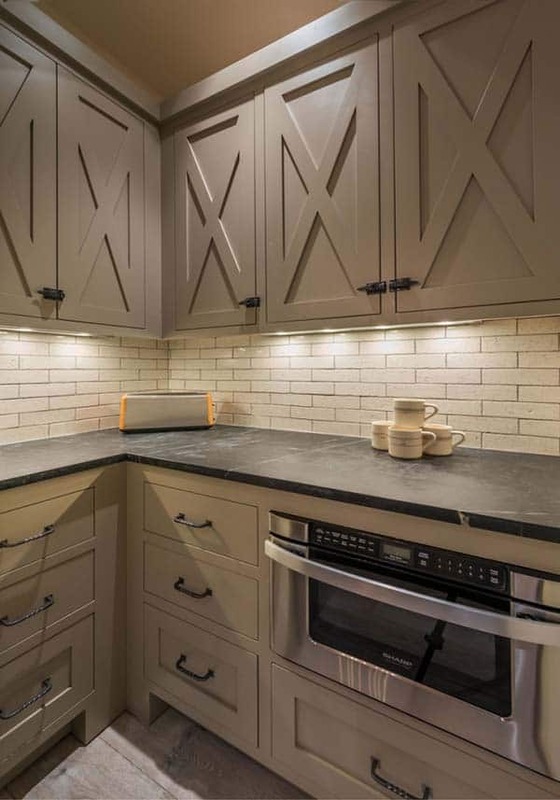 Soapstone countertops look radiant against the cream colored custom cabinetry. There is also a wood chopping block next to the stove, perfect for food prep. This kitchen was designed with entertaining in mind, with an expansive island topped with Calcutta marble. 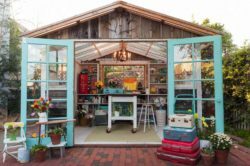 The space is illuminated with lantern style light fixtures sourced from . The marble sparkles from the lighting and was the perfect selection next to a sink since it is very durable and porous and gives a fresh, clean aesthetic. 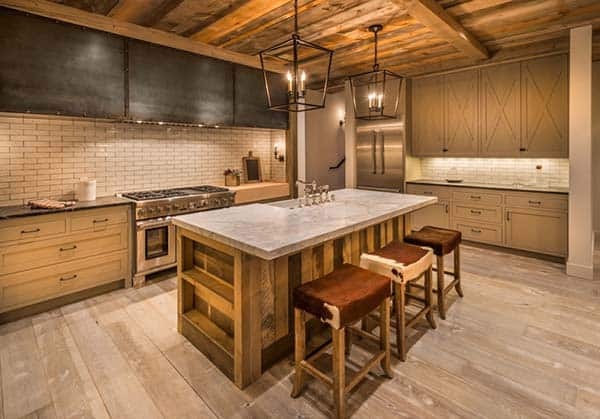 There is also a butler’s pantry in the kitchen, which is concealed by a sliding barn door. 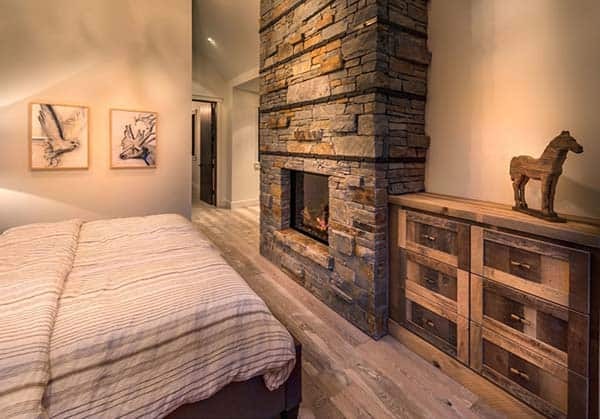 The master bedroom features a stone fireplace for added warmth. The bedding was sourced from Restoration Hardware. 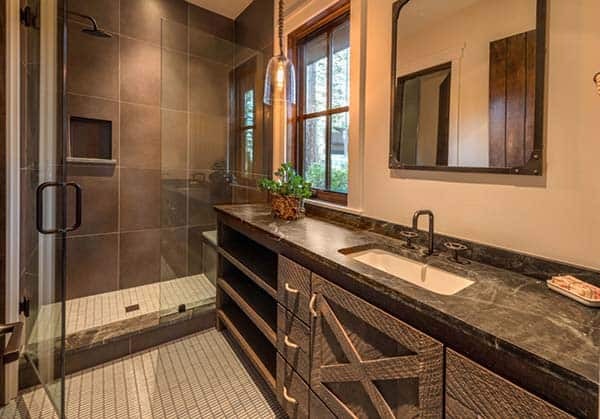 In the master bathroom, a freestanding tub in the corner looks very inviting, while wood tiles in a herringbone pattern infuses warmth on the floor. 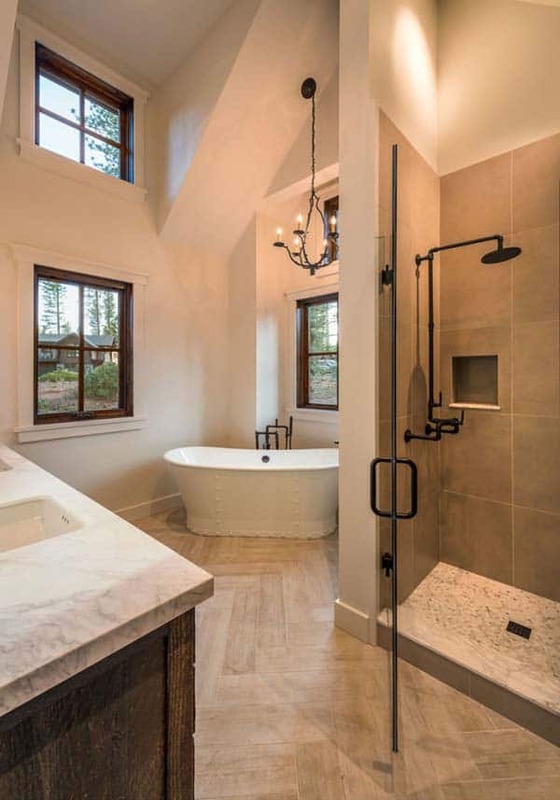 Fixtures and fittings in all bathrooms were sourced from Waterman’s Elan Vital Line. 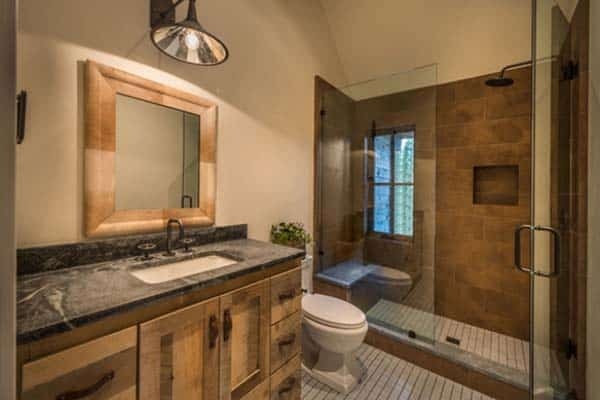 The modern rustic vernacular continues into each of the bathrooms. 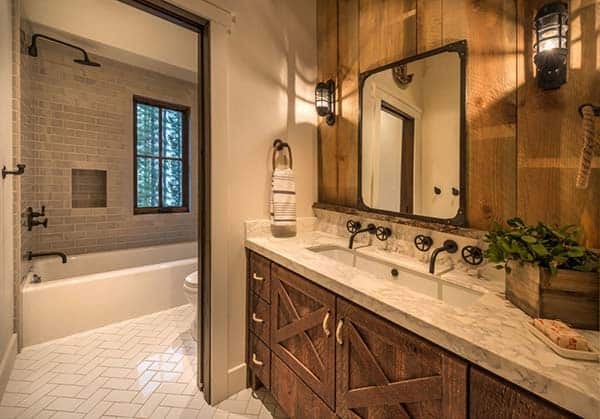 In this guest bathroom, drawer pulls were sourced from Anthropologie and floor tiles from Ann Sacks. 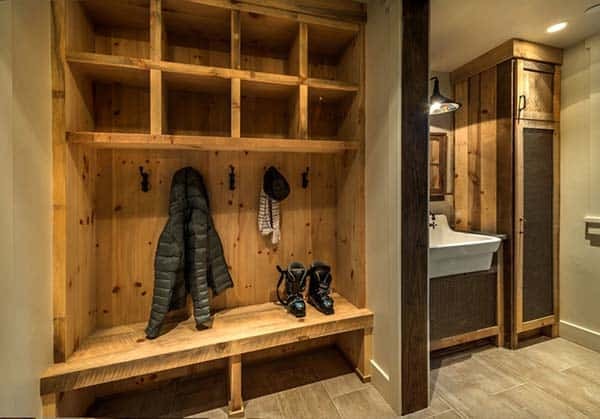 With so many outdoor activities in the area, a mudroom was an essential addition to the home, situated conveniently next to the laundry room so dirty and damp gear can be be taken care of immediately. Love this style and especially the paint choices. It looks as though you used the same color throughout, but I cannot find out what that color is. Would you happen to remember?